An international team of astronomers has discovered an ancient and dramatic head-on collision between the Milky Way and a smaller object, dubbed the “Sausage” galaxy. The cosmic crash was a defining event in the early history of the Milky Way and reshaped the structure of our galaxy, fashioning both its inner bulge and its outer halo, the astronomers report in a series of new papers. The new papers in the Monthly Notices of the Royal Astronomical Society, The Astrophysical Journal Letters and arXiv.org outline the salient features of this extraordinary event. Several of the papers were led by Cambridge graduate student GyuChul Myeong. He and colleagues used data from the European Space Agency’s Gaia satellite. This spacecraft has been mapping the stellar content of our galaxy, recording the journeys of stars as they travel through the Milky Way. Thanks to Gaia, astronomers now know the positions and trajectories of our celestial neighbours with unprecedented accuracy. 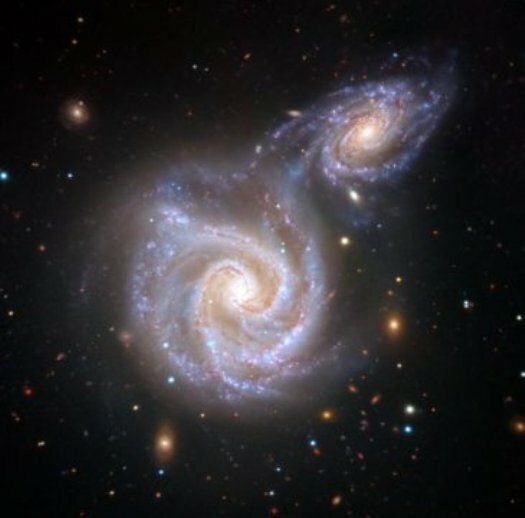 Evidence of this galactic remodelling is seen in the paths of stars inherited from the dwarf galaxy, said Alis Deason of Durham University. “The Sausage stars are all turning around at about the same distance from the centre of the galaxy.” These U-turns cause the density in the Milky Way’s stellar halo to decrease dramatically where the stars flip directions. This discovery was especially pleasing for Deason, who predicted this orbital pileup almost five years ago. The new work explains how the stars fell into such narrow orbits in the first place. The new research also identified at least eight large, spherical clumps of stars called globular clusters that were brought into the Milky Way by the Sausage galaxy. Small galaxies generally do not have globular clusters of their own, so the Sausage galaxy must have been big enough to host a collection of clusters. “While there have been many dwarf satellites falling onto the Milky Way over its life, this was the largest of them all,” said Sergey Koposov of Carnegie Mellon University, who has studied the kinematics of the Sausage stars and globular clusters in detail.